If you’re having trouble using Game bar on Windows 10—such as recording game clips or getting keyboard shortcuts to work—here are some things to try. Before you begin troubleshooting any of the following problems, you'll first want to verify that you have the latest version of Windows 10 and that all Windows updates are complete. Gamers in the European Union and Korea who are using Windows 10 N or Windows 10 KN will also need to install the Media Feature Pack for N and KN versions of Windows 10 to use this feature. How can we improve Game bar? Leave us feedback. How do I record a game if it's in full-screen mode? What should I do if Game bar and shortcuts aren’t working? Where are my game clips and screenshots? Recording only worked once or twice. How do I fix it? Why don't my customized shortcuts for Game bar work? How do I use Game bar on my tablet PC? How do I make Game bar forget my game? My game clips are blank. What happened? Why can't I take a screenshot? Why can’t I record some games when I use my multiple GPUs in a Linked Display Adapter (LDA) configuration? For PC games in full-screen (or full-screen exclusive) mode, you won’t see Game bar, but you can use the Windows logo key + Alt + R to start and stop recordings. You’ll see the screen flash when the recording starts and completes. You can also use the Windows logo key + Alt + G to record the last 30 seconds (or whatever time you picked) if you’ve already turned on background recording. If the shortcuts do not work for a full-screen game, press Win + G. You’ll see the screen flash twice confirming that the game is recognized. After this, you can then run the game in full-screen again and use the Windows logo key + Alt + R and Windows logo key + Alt + G.
Make sure you have the latest updates on your Windows 10 PC. Press the Start button, then choose Settings. Go to Update & security, then select Check for updates. Check your Game bar settings. Press the Start button, then choose Settings. Go to Gaming > Game bar, then turn on Record game clips, screenshots, and broadcast using Game bar. When playing a game, press the Windows logo key + G to open Game bar. Select the Enable gaming features for this app to record gameplay check box if prompted. The game may be running in full-screen mode. See How do I record a game if it’s in full-screen mode? above. The game may be blocking custom keyboard shortcuts. See Why don’t my customized shortcuts for Game bar work? below. Make sure you’ve updated your graphics drivers. See Hardware requirements for Game bar on Windows 10. Try choosing a different display option for your game (such as borderless windows). To see where your captures are saved, open Game bar and select the My captures folder, or press the Start button, choose Settings > Gaming > Captures. Press the Open folder button to see your captures in File Explorer. 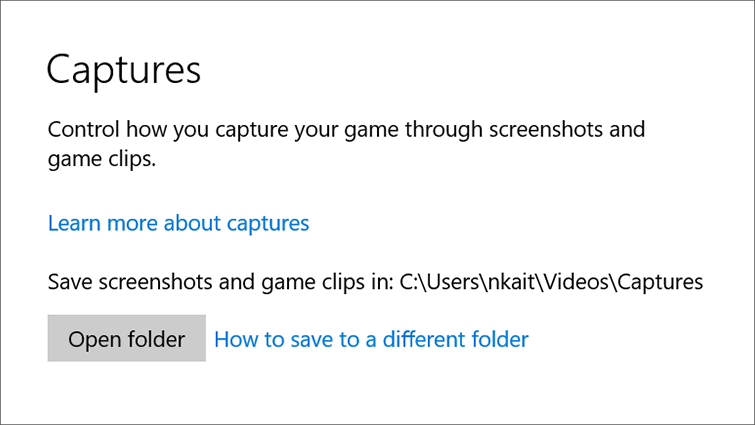 By default, game clips and screenshots are saved in your Videos folder (named Captures). The Captures folder can be moved to different places on your PC. In the search box on the Windows taskbar, type Task Manager, and then select it. In Task Manager, select More details. In the list of running processes, select the Broadcast bar server (bcastdvr.exe) process (if it's still there), and then select End task. Restart your game and try recording again. Some games block keys, so your custom keyboard shortcuts may not work with these games. Shortcuts based on the Windows logo key will always work with the latest update. To use Game bar with any game, check for updates for apps and games from Microsoft Store and install the latest version of Game bar. Windows key–based Game bar shortcuts won’t work on tablets without an attached physical keyboard, but you can create your own shortcuts that use keys available on the virtual keyboard. Press the Start button, then choose Settings. Go to Gaming > Game bar, and then enter your preferred keyboard shortcuts. 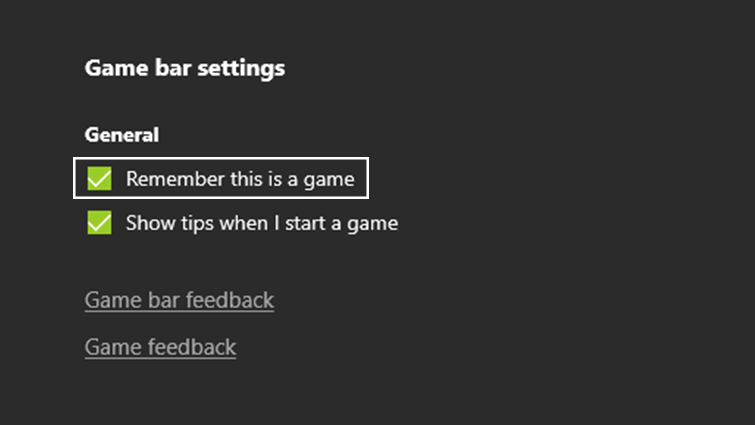 If you don’t want to use Game bar with a game or app, launch the game, open Game bar, select Game bar settings, and clear the Remember this is a game check box. Some games don't allow recordings. If you have any protected content open on your PC, it may cause your screenshot to go blank. Some games use a pixel format that is not currently compatible with Game bar in a Linked Display Adapter (LDA) configuration. ¿Quieres contactar con el Soporte técnico con referencia al problema "Troubleshoot Game Bar on Windows 10" acerca del que estabas leyendo o con referencia a otro problema?